Jane Austen meets Arthur Conan Doyle in a historical fiction debut for fans of Ruta Sepetys and Elizabeth Wein. Born into an affluent family, Leo outwardly seems like a typical daughter of English privilege in the 1870s: she lives with her wealthy married sister Christabel, and lacks for neither dresses nor trinkets. But Leo has a crippling speech impediment that makes it difficult for her to speak but curiously allows her to mimic other people's voices flawlessly. Servants and ladies alike call her "Mad Miss Mimic" behind her back... and watch as she unintentionally scares off every potential suitor. Only the impossibly handsome Mr. Thornfax seems interested in Leo...but why? And does he have a connection to the mysterious Black Glove group that has London in its terrifying grasp? Trapped in a city under siege by terror attacks and gripped by opium fever, where doctors (including her brother-in-law) race to patent an injectable formula, Leo must search for truth in increasingly dangerous situations - but to do so, she must first find her voice. Sarah Henstra is a professor of English at Ryerson University, where she teaches courses in Gothic Literature, Fairy Tales & Fantasy, and Women in Fiction. Some of her best story ideas come from class discussions. She lives in Toronto with her husband, two sons, and a poodle named Nora. 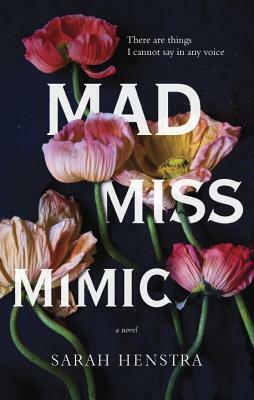 Mad Miss Mimic is her first novel.